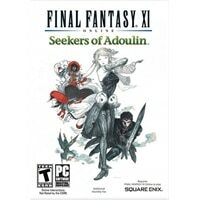 Seekers of Adoulin is the fifth installment of the popular online role-playing series of FINAL FANTASY XI. With the advanced expansion, players can now extend their journey with never before seen monsters, characters, jobs, and uncharted territory ready to be conquered. Reclaim the lands of Ulbuka back to civilization to earn great benefits and unlock amazing content. Explore the poisonous marshes and murky caves and fight never before seen monsters with the Rune Fencer and Geomancer jobs.